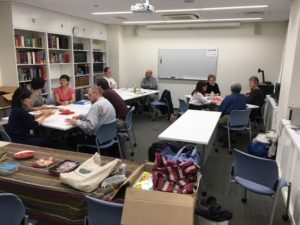 “Creating Community: Learning Together 4” (CCLT4) was an informal, relaxing afternoon Learner Development SIG conference that took place on Sunday December 16 12:00-17:00 at Otsuma Women’s University, Chiyoda-ku, Tokyo. You can download the CCLT4 Programme booklet here. If you are interested in helping with CCLT5 in 2019 , please feel free to contact us at <ldsigtokyogettogethers@gmail.com>. Attending the 28 October get-together were Alison Stewart, Andy Barfield, Aya Hayasaki, Blair Barr, Cecilia Fujishima, Dexter Da Silva, James Underwood, Jenny Morgan, Ken Ikeda, Kio Iwai, Martin Cater, and Miyuki Kimura (with regrets from Tim Ashwell, Koki Tomita, and Stacey Vye). A hearty welcome to Aya Hayasaki and Cecilia Fujishima on taking part in their first get-together. We all had a great time together, discussing self-directed learning, developing students’ engagement with content-based learning through writing, self-assessment, corrective feedback, and learner identities. You’ll soon find here a short report and reflections from participants at the October get-together. The next get-together is taking place on Sunday 28th October at Otsuma Women’s University, and we’re looking forward to seeing you there. Attending the 22nd July get-together were Andy Barfield, Martin Cater, Ken Ikeda, Lee Arnold, Jenny Morgan, Kio Iwai and Koki Tomita (with regrets from Akiko Kiyota, Alison Stewart, Mike Nix, and Ritsuko Yamaguchi). Reflections from the July get-together can be found here. 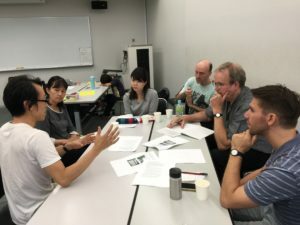 Attending the 24th June get-together were Yusei Ando, Andy Barfield, Martin Cater, Ken Ikeda, Miyuki Kimura, Fumiko Kurosawa, Jenny Morgan, and Mike Nix (with regrets from Tim Ashwell, Blair Barr, Kio Iwai, Akiko Kiyota, and Alison Stewart). Reflections from the June get-together can be found here. What meanings might learner development have for you/us/our students in 2018? Why? * What different interests do you/we/they see learner development as covering? * What contradictions do you/we (and your/our learners) encounter in aiming for greater autonomy and empowerment in your/our/their learning? * How might we/you/they continue to explore and promote learner development within the affordances and constraints of different educational systems and structures? * How might engagement with these questions help us – as learners, teachers, members of different communities, and citizens – resist pervasive pressures and attacks on inclusion and equality as public values in civil society? Longer term, this could be the start of some kind of project (print? video? web-based? —-?). You are welcome to join us in these exploratory discussions at the June get-together. We will also take time to talk about our own learner development practices and concerns. Many thanks to Otsuma Women’s University for hosting the get-together and to Ken for making the on-site arrangements. Taking part in the April get-together were Tim Ashwell, Andy Barfield, Ken Ikeda, Kio Iwai, Miyuki Kimura, Jenny Morgan, Alison Stewart, Koki Tomita, and Ritsuko Yamaguchi (with regrets from Martin Cater, Dexter Da Silva, Ian Hurrell, Peter Joun, and Mike Nix). Participant reflections can be found here. 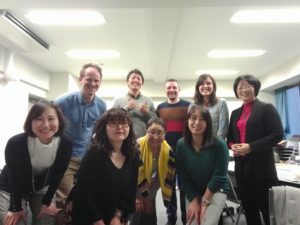 The February Get-together was attended by nine LD SIG members (Nicole Gallagher, Tokiko Hori, Ian Hurrell, Kio Iwai, Miyuki Kimura, Akiko Kiyota, Fumiko Kurosawa, Koki Tomita, and James Underwood), with regrets from 13 people (Tim Ashwell, Andy Barfield, Blair Barr, Martin Cater, Dexter Da Silva, Huw Davies, Peter Joun, Jenny Morgan, Colin Rundle, Alex Shaitan, Julie Torgeson, Stacey Vye, and Keiko Yuyama). We started the get-together with some mingling time. As this was the last session before the start of the new academic year, everyone had much to talk about regarding the new challenges in their upcoming classes. After this, each participant shared the puzzles that they wanted to discuss in more depth. As there was a lot of cross-over between the topics, we decided to split into two groups. Read here summaries of both discussions. The first get-together of 2018 took place January 28th 3 – 5.30 pm with 10 people taking part: Tim Ashwell, Andy Barfield, Martin Cater, Nicole Gallagher, Tokiko Hori, Ian Hurrell, Fumiko Kurosawa, Jenny Morgan, Mike Nix, and Alex Shaitan, and regrets from: Mayumi Abe, Dexter Da Silva, Satchie Haga, Chika Hayashi, Kio Iwai, Peter Joun, Nick Kasparek, Miyuki Kimura, Akiko Kiyota, Debjani Ray, Colin Rundle, Koki Tomita, and Keiko Yuyama. This was a high-energy session, starting on the dot, people talking in pairs and changing once or twice through to 5.30 pm, and time flying by as if in the blink of an eye. Woooosh! Great conversations and discussions were had by one and all! We hope to see you at the next get-togethers in February (02/24) and April (04/22)! The December 2017 get-together took place December 17th 3.30 pm to 5.30 pm with 13 people taking part (Akiko Kiyota, Andy Barfield, Colin Rundle, Ian Hurrell, Jenny Morgan, Keiko Yuyama, Kio Iwai, Koki Tomita, Lee Arnold, Miyuki Kimura, Nicole Gallagher, Peter Joun, and Tim Ashwell) with regrets from Andy Tweed, Blair Barr, Debjani Ray, Huw Davies, Martin Cater, Stacey Vye, and Tokiko Hori. We had a really enjoyable free-rolling set of discussions in pairs and small groups about our learning this last year and what we are planning to do next. One change we decided was to try holding the get-togethers later in the afternoon on Sundays, starting from 3 pm and going through to 5.30. We also had a great bonenkai in a nearby Chinese restaurant. A big thank you to Ian and Kio for organising the bonenkai, and to Ian for all the arrangements he has made at Rikkyo for the get-togethers in 2017. Season’s Greetings and a very Happy New Year to everyone! Proposal for 2018 get-togethers: Thinking towards the future about the get-togethers and how they might evolve next year, the following is one alternative that the three of us have been talking about. We welcome discussion of this and other ideas for 2018. One possibility might be to move towards a blended approach for the get-togethers, for example, combining face-to-face get-togethers in the first few sessions of the year (say January, February, April, and May) with decentralised small-group meetings from May to September, and whole-group meetings in October and December. In the initial months of the year participants could focus on identifying common issues of interest, discussing collaborative research and writing projects about learner development, and planning how to put their research ideas/puzzles/ questions into action in the Spring semester. Then, in the interim period from May to September/October, each collaborative group would meet decentrally to discuss the implementation of their research ideas, according to group members’ schedules, using online tools such as Skype and sometimes meeting face to face for a bite to eat and drink together, as and when people had space and time to do so. In the final period of the year “conventional” get-togethers in September and/or October would let groups start to consolidate their work with a view to sharing it publicly by the end of the year (December) or the start of the next (January). ** Would such a blended approach offer a way forward for 2018? ** Are there other approaches that you feel would be worth trying? Please do share your views with us in person at the December get-together and bonenkai, or by email at <ldsigtokyogettogethers@gmail.com>. Many thanks. The October 2017 get-together took place October 29th with eight people taking part (Akiko Kiyota, Andy, Ian, Jenny, Kio Iwai, Miyuki Kimura, Peter Joun, and Tim Ashwell) with regrets from Blair Barr, Chika Hayashi, Debjani Ray, James Underwood, Lee Arnold, Mayumi Abe, Nick Kasperek, Nicole Gallagher, Rob Morel, Shoko Kita, Sumire Shiba, Tokiko Hori, and Yoko Munezane). The eight of us enjoyed our discussions together, and we’re looking forward to the end-of-year get-together in December; we hope to see many of you there, and, ahead of that, at JALT 2017 later in November!! Short reports on the September, June, May, April, February, and January get-togethers can be found below. Links to group write-ups can be found below. 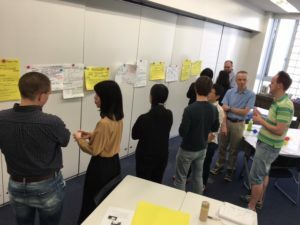 Taking part in the May get-together were Lee Arnold, Tim Ashwell, Andy Barfield, Blair Barr, Martin Cater, Nicole Gallagher, Ian Hurrell, Kio Iwai, Peter Joun, Miyuki Mihara, and Jenny Morgan (with regrets from Mayumi Abe, Nick Kasperek, Akiko Kiyota, and James Underwood). The May get-together had the theme of “Explorations: Sharing Possibilities for Collaborative Learner Development Projects: Exploring Puzzles and Finding New Paths.” During the afternoon people shared their learner development interests, discussed possibilities for exploring a learner development puzzle or question, and discussed learner development projects they would like to do in collaboration with (an)other get-together participant(s). The groups and projects are not fixed, and are always open to new people joining in. This was the second get-together held at the new venue at Rikkyo University Ikebukuro Campus. 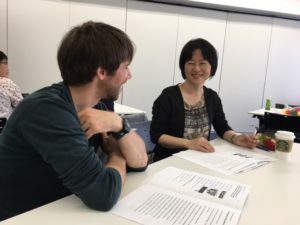 After a warm welcome for Miyuki Mihara, a new member of the SIG attending her first get-together, we did a brief mixing and mingling activity. This got everybody interacting and talking about their working contexts and learner development interests. We created individual mini-posters outlining our LD interests, challenge/puzzles, and goals for a collaborative learner development project. Jenny, Kio, Lee, and Nicole focused on peer support for writing about learner development research. Go here for a report on the group’s discussions. Blair, Ian, Martin, Miyuki, and Tim formed the Motivational Strategies group at this month’s get-together. Use this link to read a report on their discussions. Andy and Peter looked at issues to do with critical literacy and reflection. Click here for a report on their discussions. In the final part of the get-together, each group agreed to write up a report of their discussions using Google Docs. We also talked about keeping contact through to the next get-together in June. Taking part in the first get-together of the new school year were Mayumi Abe, Tim Ashwell, Andy Barfield, Martin Cater, Ian Hurrell, Kio Iwai, Nick Kasperek, Akiko Kiyota, Jenny Morgan, Sumire Shiba, and James Underwood (with regrets from Blair Barr, Fumiko Kurosawa, and Huw Davies). The April get-together had the theme of “Beginnings: Ideas and Possibilities for Collaborative Learner Development Projects: Sharing Interests and Starting Questions.” During the afternoon people shared their learner development interests, discussed possibilities for exploring a learner development puzzle or question, and started imagining some kind of learner development project they would like to do this school year in collaboration with (an)other get-together participant(s). The groups and projects are not fixed, and are always open to new people joining in. This was the first get-together held at the new venue at Rikkyo University Ikebukuro Campus. We began with a brief mixing and mingling activity, which got the get-together off to an energetic start. After catching up with old friends and getting to know new members, we formed small groups to share with each other our current working contexts, learner development interests, as well as our individual goals for participating in LD get-togethers this school year. We then created and shared mini-posters outlining our LD interests, challenge/puzzles, and goals looking for possible connections for collaboration. After viewing and discussing the posters, we formed three groups. Andy, James, Mayumi, and Nick talked together about reflective practices and processes in learner and teacher development. Jenny and Kio shared their current research projects and advised each other on possibilities for analyzing the data. Akiko, Ian, Martin, Sumire, and Tim formed the beginnings of a collaborative group to discuss motivational strategies in learner development. In the final part of the get-together, each group gave a short summary of their discussions. We also talked about some possible goals for keeping contact through to the next get-together. 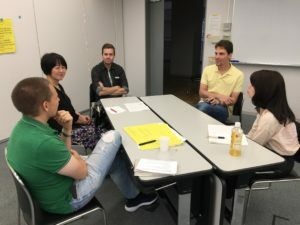 After sharing posters, Akiko, Ian, Martin, Sumire, and Tim noticed a common interest in developing motivation so we decided to form a discussion group focusing on motivational strategies. As this was our first time to meet, we decided to focus on discussing our goals for participating in the get-togethers and our approaches to developing motivation in our various working contexts. Below are a collection of reflections from the members of the group. Akiko: First of all, for me what was most precious was that I was able to meet other teachers. Especially being a part-time teacher, it is often difficult at work to have occasions to sit and discuss, without haste, with other teachers about issues, e.g., motivation. I was also very appreciative of the meeting atmosphere, which was very warm and friendly as well as open and creative. For this, I would like to thank Andy, Jenny, and Ian, the three organizers who nicely set the scenes, and the attendees who were willing and cooperative, with positive mindsets. Speaking of teacher motivation, I think it is always good to meet and speak with such good-hearted teachers. In our group discussion, I think we covered various topics. One of the points among various interesting themes discussed that I would write here in my reflection, because it gave me a theme to ponder, is: the role of the teacher, especially students’ mother-tongue speaking teacher, as a mentor or a ‘counselor’. I was interested to see many teachers being interested to hear Sumire’s stories of her being a ‘counselor’ for her students. This is what (many or some? …or, a few?) Japanese teachers often do in their 10-minute break after a class, or through communication via ‘furikaeri sheets [reflection sheets]’ (post-lesson reflective writing) in students’ L1. Here, I am not bringing in the NEST / NNEST dichotomy, but rather, I am highlighting the issue of motivating low-proficiency students in the area of motivational mentoring or dialogues, and the use of L1. From the meeting, I decided to read back the 90s-2000, some examples of how originally the Self-Determination Theory was used as a framework for understanding processes of motivational interviewing (counseling) in clinical psychology, i.e., a counseling style for facilitating behavioral change. I will keep on learning! I would like to thank everyone, and look forward to the next meeting. Ian: Personally speaking, I feel that any teaching endeavor starts with the motivation of the learner, as it can be difficult, if not impossible, to get students invested in learning programs if motivation to learn is not present. Therefore, I came to the get-together interested in forming a discussion group for developing motivational strategies, and after sharing our posters, I was happy to see that there were several others also interested in this area. Having little experience of working in collaborative groups, I wasn’t exactly sure about what I wanted to get out of the meeting. However, Tim talked about a group he worked with in the past who regularly met to discuss Collaborative Learning, and, over the course of many discussions, were able to produce a collaborative book project. This sounded like an interesting idea so we decided to start our discussion group by sharing our approaches to motivating learners, particularly low-level learners. Tim and I stressed the importance of developing a sense of ownership to get students truly invested in the learning program rather than viewing classes as credits to be earned. Martin raised the point of keeping activities varied and interesting to disrupt expectations and make learning programs more enjoyable. 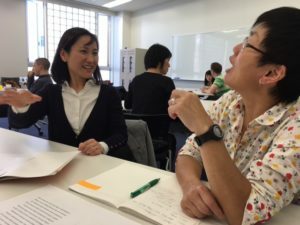 Akiko emphasized fostering positive interpersonal relationships between teachers and learners as well as between the learners themselves. She related a personal story of a particularly rude teacher she encountered while studying abroad, who had a significantly negative impact on her motivation in that class. Sumire highlighted the need to reduce anxiety by helping students to develop a positive self-image and shared stories of how she counsels students dealing with anxiety. All of the concepts raised in our discussion have given me much food for thought since our meeting and I look forward to delving into them more deeply in the next get-together. Martin: LD get-togethers have become much more focused than last year as groups are beginning to form around shared interests. Despite this focus, I feel sure that the flexibility and inclusive nature of the gatherings will mean that people will occasionally move between groups in order to pick up new ideas and inspiration for their own teaching. It was great to meet Akiko and get to know Sumire a little better at this session. On motivation, Akiko, like myself, seems to strongly believe that lessons should be fun if we are to engage our students. Many years ago, whilst working for an eikaiwa chain, one of my line managers advised me to make adult classes as much like children’s classes as possible. He told me that just as children enjoy throwing balls around, so do adults. I quickly understood that he was not suggesting I do activities which patronise learners but rather engage them in creative, unexpected ways which challenge their expectations of what constitutes an English lesson. It is perhaps appropriate to note this here as the get-together this week started with a get-to-know-you activity using a ball. I was particularly interested to hear some of Sumire’s accounts of learners’ experiences in the classes where she works as a teaching assistant. 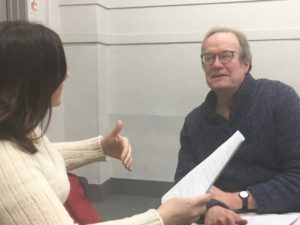 In her capacities as a fellow Japanese speaker, English role-model, student counsellor, and the warm person of Sumire herself, learners are clearly prepared to share things with her that they would be unwilling to tell their instructors. In this I am reminded of Tim’s poster presentation at CCLT3, where he explored whether student evaluation of classes varied depending on the asker. 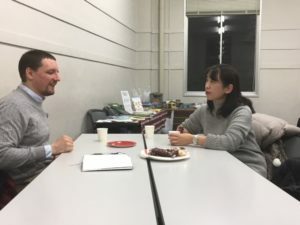 I look forward with interest to hearing more from Sumire, as I am sure what she tells me will help me learn more about my own university students. I also look forward to developing ideas further with the whole group at future get-togethers. Sumire: I was so happy to join the last LD-SIG meeting. My general impressions of get-together was sharing our past experience or what our present research was about. To be honest, since I did not start off any research last year, I felt like that I was just sitting on the chair and listening to the other members. Even though the get-together was not boring at all to me, I always thought how different the get-together meeting I would be able to experience if I had more knowledge and interests. Everything depended on myself; however, this time, I could feel differently from last year. Also, I did not stop thinking about what my interests were. I really appreciated my supervisor, Mr. Ikeda, for having me in the get-together. Now, the get-together is, of course, still one of a place to share interests and experiences, and it gives me opportunities to dig one specific interest deeper and deeper. From the last get-together, I realized that a research may well last forever unless we put a time period on it. I am so thankful to participate a group discussing about students’ motivation with Ian, Tim, Martin and Akiko. I am still not clear about Collaborative Learning, but I would love to discuss about students’ motivation more. I know just “motivation” is too vague, so I want to seek how their motivation is stimulated positively and negatively, what are priorities for them to keep their motivation and what are differences of teaching style between language school in overseas and public or private schools and universities in Japan. As I described that the classes are mostly as credits for students not as lessons enriching their life-long study, I wondered what students wanted to get/acquire from English learning and what their expectations are. I would love to discuss motivation with you all more and find a core from the theme of motivation. Also, I really appreciate any comments and advice including not only good things but also feedback for what I am saying in the get-together. Mayumi, Andy, James, and Nick formed a group around the related issues of reflection on teacher and learner development. 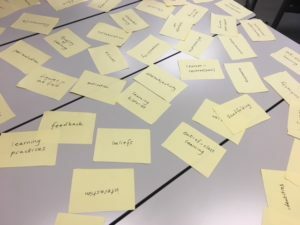 We initially connected reflection to content-based instruction and self-directed learning through fieldwork and other tasks, but then expanded our ideas to include other domains of learner and teacher reflection. We realized together that we often ask our students to reflect, but we are less methodical and consistent about reflecting ourselves. The unifying theme that then emerged was teacher reflection for professional development and greater learning – and to include, as a result, “researcher reflection” too. Through talking together we agreed that these different reflection practices need not take the currently popular form of individual outcome-based problem solving. Rather, our reflection should be at least partly open and collaborative, and it should involve us as teachers and researchers, so that it leads us to new puzzles and challenges, as well as raises new questions for understanding what our learners do (and what they make of what they do) and what we do (and what we make of what we do). We also came to agreement that we should/might/need to turn our own and our learners’ attention outward to find new connections to broader issues outside of classroom learning and learner development. This would move (our exploration of) reflection practices to include a more critical interplay with the social world and questions of social justice. By doing this, we felt that exploring issues of reflection might connect to ideologies of reflection and critical literacy too. Towards the end of our discussion, we decided to form a “Slack” team to share our reflections online with each other between get-togethers, as well as links to interesting articles and resources to do with reflection. We also resolved to begin more reflective practice together and look at reflection in different disciplines and areas of social activity, not just in language education. Kio and Jenny met in a group of two for “people working on own research data with a view to writing individual articles”. 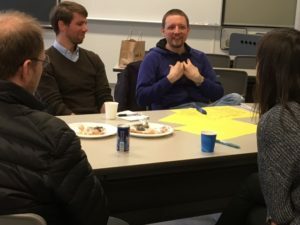 We first talked a bit about our teaching-learning contexts and connections with our current research. Kio has already started to analyze her rich data about “high school students’ one-year study abroad experiences” and the impact of that experience on the beliefs and mindset of the participants e.g., how their exchange experience has affected their lives and ways of thinking. However, she feels stuck on how to analyze her data. Jenny is focusing her research on the positive effects of reflection writing on her third-year students in a small content-based university seminar class. An end-of-course learner survey aimed to explore: 1) learners’ English language development, confidence, motivation, research skills; and 2) learner engagement with challenging content such as global issues; whether students believed the reflective writing helped them develop their criticality and creativity. Jenny has gathered learner data from surveys and short interviews, but also feels stuck right now on how to start ‘coding,’ what patterns or connections to look for in the data; and then how to approach writing an article. We enjoyed a stimulating discussion, thinking aloud to get feedback and ideas for possible focus threads for analyzing our data, and beginning our individual articles. We decided we could be writing peer support for each other – just encouraging each other in our goal-setting and writing progress e.g., (proofreading drafts along the way?). Finally, we each made small proximal goals to reach before May get-together. Kio: read about “learner beliefs,” “learner identity,” “imagined EFL selves,” “Japanese students’ study abroad.” Sort out any salient words and phrases in my data. Jenny: re-visit my data and brainstorm possible research questions for my paper; ask Kio and others for feedback. The May get-together will be taking place on Sunday May 28th 2017 at Rikkyo University Ikebukuro Campus 2-5pm in Room 7204. For directions please see http://ld-sig.org/venue/ . Taking part in the second get-together of 2017 were Lee Arnold, Tim Ashwell, Andy Barfield, Martin Cater, Nicole Gallagher, Ian Hurrell, Ken Ikeda, Nick Kasparek, Tyler Kinkade, Debjani Ray, and Julie Torgeson (with regrets from Blair Barr, Fumiko Kurosawa, Huw Davies, Jenny Morgan, and Fumiko Murase). Report compiled by Lee – many thanks, Lee! 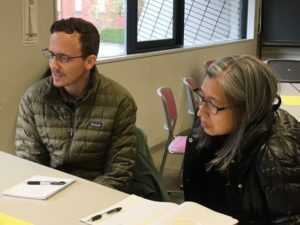 The second get-together in Tokyo for this year marked the last time they were held at Otsuma Women’s University for the time being, as Ken Ikeda is departing for a sabbatical in the U.S. from April. Since September 2012 Ken has worked constantly behind the scenes to secure the facilities at Otsuma, and his efforts have made it possible for LD in Tokyo to maintain the get-togethers, hold the Creating Community: Learning Together informal afternoon conferences, and play a major role in keeping the Tokyo activities of the SIG consistent and coordinated. He will be greatly missed and we wish him well in his sojourn for the year. Thank you Ken! Today’s get together began with mingling of some familiar faces along with some new and returning members with Tyler and Julie rejoining the get-together and Nick taking part for the first time. 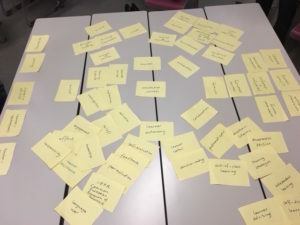 This led into a 30-minute plenary discussion of connections between the different learner development interests that people have. Here we tried to identify umbrella themes which people with similar interests might work with, and at the end of these discussions learner motivation, (teacher and learner) reflective writing, and collaborative projects emerged as likely areas of shared sustainable focus. Teacher and learner reflective writing (Andy, Julie, Ken, Lee, and Tyler). What factors does motivation consist of? How might these factors play out in practice? Engaging students and allowing students to take some ownership over their learning. Focusing on meaningfulness in the activities we teach. Raising awareness of the significance of learning beyond the classroom. A focus on growth and development of self-efficacy. Consideration of affective factors that might create barriers to motivation. Making happiness of the learners a priority, as learners who are not happy will not be motivated to learn. Giving learners a variety of activities and incorporating different learning styles into those activities, such as visual, verbal, and kinesthetic learning styles. Focusing on the classroom as a social space and an environment based on trust. Developing good learner-learner relationships through teamwork activities and activities that take into account different personality types. Developing good learner-teacher relationships through showing trust in the learner and having a principled approach to the creating learning programs that can be clearly and convincingly communicated to their learners. Finally, connected to student-teacher relationships are extrinsic motivation factors such as teachers injecting their energy into the classroom and acting as an example for learner by showing a genuine enthusiasm for learning. Providing learners with a variety of activities to keep them interested. Aligning the expectations of teachers and learners through involving the learners in the negotiation of goals and tailoring the program to meet those goals. Lowering anxiety by developing a positive group dynamic among learners through teamwork and ice-breaker activities. Teachers developing a positive relationship with their students by showing a genuine interest in their students’ development and adapting their approach to meet their students’ various learning styles and need. Engineering successes so that learners can build confidence. Looking for turn-around opportunities when students are struggling with their learning programs. Regularly coming back to the goal and expectations established for the learning program so that both learners and teacher can remind themselves of the meaningful purpose of what they are doing. Unfortunately, we ran out of time before we could finish our discussion of how to maintain motivation in the later stages of learning program and after the learning program has been completed. This might be a topic we could come back to in subsequent get-togethers. How might we include spaces for reflective writing in our own lives and also in different classes that we teach? How do teachers and students understand the concept (and practice) of reflection? Why? 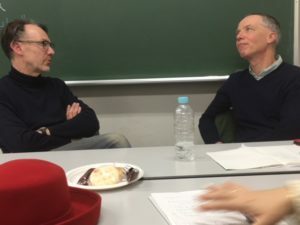 Ken: We discussed the differences in how Japanese students might regard reflective writing such as “hansei” and “soukatsu.” “Hansei” carries a negative connotation of ‘reflecting on one’s erroneous acts’. As for “soukatsu” [総括], Andy mentioned a “rotation kamoku” on multilingual issues that he co-teaches with several law, politics, and second foreign language colleagues. Each week students are asked in the last 15-20 minutes of the lecture to write a reflection in which they summarise the main points of the lecture, identify interesting points, and lastly raise questions. The purpose of the “soukatsu” is to help students think through their understanding, make their interest conscious, and raise questions about the issues in the lecture, rather than think over learning processes or goals. How can learners be guided to develop reflective writing? What scaffolds do we use? Why? What challenges do our students and we face in writing reflectively? Why? Why do some forms of academic writing “bleach” voice and personal experience? Ken: Was this in reference to the adherence to a particular style (APA)? Andy: More in reference to absurdities such as asking writers not to use “I” when writing about their own practices to do with learning and education. How do we move from reflection to criticality? What differences can we trace between “reflection” and “reflexivity”? How do these differences connect to Exploratory Practice and Critical Pedagogy? 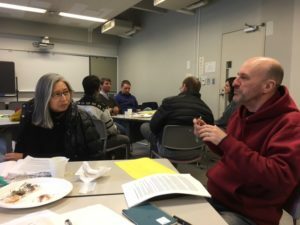 At the very end of the get-together, a brief announcement was made about the deadline for submitting proposals for the Learner Development SIG Forum on “International Communities: Fostering Learner Development on a Global Stage” at JALT2017. Exploring the theme of fostering international mindsets through autonomous learning both inside and outside the classroom, presentations could be based on completed or ongoing research in this area, or practical teaching ideas from a range of teaching and learning contexts. Please note that the deadline for proposals is Monday May 1st 2017. For more details go here. Many thanks! Taking part in the first get-together of 2017 were Andy Barfield, Blair Barr, Debjani Ray, Fumiko Kurosawa, Ian Hurrell, Jenny Morgan, Keiko Yuyama, Ken Ikeda, Lee Arnold, Martin Cater, Mayumi Abe, Nicole Gallagher, Peter Joun, and Tim Ashwell (with regrets from Alison Stewart, Huw Davies, Marcel Van Amelsvoort, Masuko Miyahara, and Sarah Morikawa). Happy New Year to all! It was great to begin 2017 with a lively meeting of fourteen people who attended our January get-together in Tokyo. Nice to catch up with everyone after a very successful CCLT3 in December and New Year break (gosh, that seems aeons away now in the midst of grading and reports!) – and we were very happy to welcome Keiko and Peter to their first get-together too. We started the get-together with an introduction round to welcome new participants, Peter Joun and Keiko Yuyama. Always good to welcome new energy, and thanks to members who’re reaching out to new members for the get-togethers. We then discussed the new venue for the Tokyo get-togethers from April 2017, and dates for the monthly meetings. 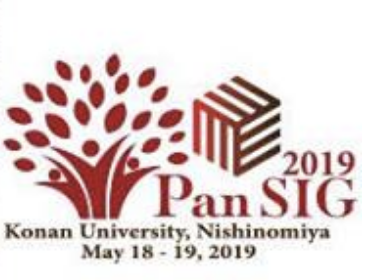 Many thanks to Ian for firming up the booking of a meeting room at Rikkyo University for the first three get-togethers from April; thanks also to Tim for finding out about Komazawa University as a possible back-up location. Sunday 17 December 12.00 to 17.30, venue TBA: Creating Community Learning Together 4 (CCLT4), an informal afternoon conference for learners and teachers. We confirmed with each other that, in deciding these dates, we are making a commitment to meet regularly. The get-togethers work best when we create continuity and development from one get-together to the next, with a positive sense of moving forward together. Next, we came to the all-important topic of the focuses and format for this year’s get-togethers, which is connected to sustaining interest and attendance at the get-togethers. We spent a little time reading and commenting on the responses to the short “Developing the Tokyo Get-togethers in 2017” online survey that 21 people responded to in November and December last year. As a “participant-centred” SIG, the get-togethers are entirely reliant on the those attending co-creating the format and content of each meeting by bringing along their own pedagogic interests, puzzles and challenges, and/or research interests and concerns, to do with “learner development.” How do we wish to use these three hours on a Sunday afternoon? People expressed the need/desire for some kind of structure, some degree of continuity – of themes, of people to talk with. Yet, we also want to balance any structure with the “open, inviting culture” of LD, keeping the looseness and spontaneity which allows us to create whatever happens each time with whoever turns up. Participants bring to each get-together samples of student work and related teacher puzzles/challenges, to share ideas and explore practical pedagogic issues that they face with their learners, so the get-togethers involve “teacher support group” discussions and sharing. In the past this has been done, and it works best when people prepare copies of student artefacts/work for such discussions. Another option is at the start of the get-together participants share their learner development themes/topics/areas of focuses, and then people split into ‘like-minded focus groups’ to discuss and learn about a theme or research focus of interest. At subsequent get-togethers people continue to meet with the same theme group to develop and explore ideas more deeply. From experience it’s good if people have the option to change groups, so some flexibility is needed with this option. 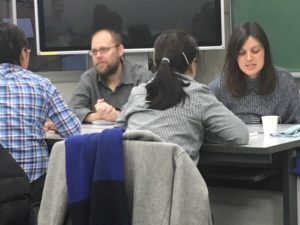 Past theme-based discussion groups led to some members later presenting together at the national JALT conference and writing up their learning and research together for the conference proceedings. Another group’s discussions formed the basis of a book project on collaborative learning. Many of the research team members have since become active in the LD SIG. 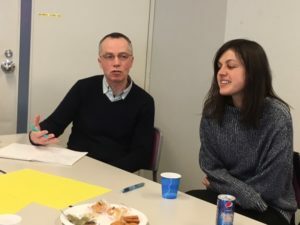 Some people said they had very much enjoyed the short workshops on doing research that individual members had presented in the first part of get-togethers last year (e.g., Exploratory Practice, interview-based research, narrative research, and diary research). Suggestions for continuing with this in 2017 led to the idea of having workshop ideas come from get-together participants so that sometimes people could volunteer to give an exploratory presentation on a learner development theme that interests them. Another possibility that some people would like to try includes people giving practice presentations to get feedback and critique before presenting at bigger conferences. This might be a particularly good focus for the October get-together where people could run through their presentations for JALT2017 and/or ideas for CCLT4. Such presentation-based workshops might be 20-30 minutes long with plenty of time for feedback and Q&A. Designate loose time-slots for say: similar format of mingling and sharing learner development interests, questions, and puzzles, with a 60- to 90-minute workshop/ teacher puzzles free-talk with student samples/ short workshop presentations from the participants/ working on research themes in small groups. Of course, these time-slots would be negotiated by whoever attends on the day. As part of the rolling discussions around structuring the get-togethers and aiming for Creating Community Learning Together 4 in December, various suggestions were made about reaching out and linking up in an informal way with members of other teacher groups and Special Interest Groups (SIGs) in the greater Tokyo area. 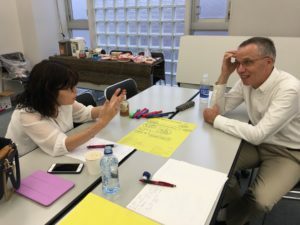 It might be possible for example to make some connections with a Reflective Practice group that has started up at Rikkyo University. We could also invite CALL SIG members to participate in the get-togethers and explore learner development dimensions of working with different forms of technology. Another link-up would be to encourage teachers with global issues interests to come and take part in the get-togethers. There is also the Framework and Language Portfolio SIG that is interested in a joint event with LD in 2017. Many ideas were mentioned, and we agreed that we want to keep arrangements informal so that CCLT4 keeps its accessible, student- and teacher-friendly, interactive character. We also discussed how the get-togethers can lead into reflective writing for Learning Learning, the newsletter of the Learner Development SIG. Some participants from CCLT3 last year are writing short reflection reflections about the conference. 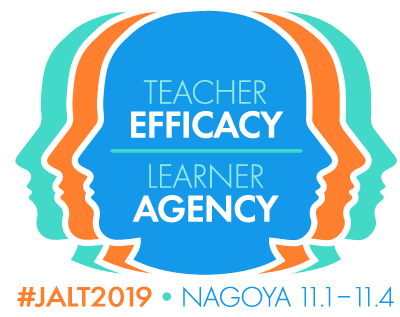 Other presenters are putting together short reflective articles of 1000 to 2000 words about their own presentations, and these will be combined with write-ups from the SIG’s JALT2016 Forum for publication in a special issue of Learning Learning in 2017. The idea is for each short reflective article to be followed by 2 reader responses from SIG members. Several people at the January get-together expressed an interest in writing a reflective reader response and signed up to do so. It’s quite possible that other writing will emerge from the discussions at the get-togethers this year, and later lead into different publishing opportunities. Finally we talked about a good, sustainable way to keep a record of each get-together that can be shared publicly. In the past we have done collective write-ups, but this has been somewhat of a burden at times to do and put together. For 2017 we agreed that a different person each time would take the responsibility of writing up a get-together. The recorder would be responsible for creating a Google doc and writing a summary of the get-together that would then be posted on the main LD website. For January Jenny kindly offered to do this. Many thanks to Jenny and Ian too for joining the get-together organising team for 2017.